Most of us yogis espouse the idea that yoga can fix just about anything. Whether your ailment is physical, mental, or emotional, doing more yoga is the answer! While yoga is comprised of many components — including breathing, visualization, meditation, chanting, and more — when most people think of yoga, they think of stretching. Stretching is vital to good health and mobility: It helps to circulate blood, lymph, and other vital fluids throughout the body, it improves joint mobility, it relieves pain and muscular tension, creates flexibility, better posture, and increases energy. It feels good to stretch. Even dogs and cats do it! A life lived without stretching usually means a life lived with pain, limited mobility, and lowered vitality. However, there are times when stretching can make matters worse. When muscles are inflamed. If you have an acute injury with burning or searing pain, this is not a time to stretch. It’s time to rest. You might need ice, heat, and an anti-inflammatory. As the body begins the healing process and the intense pain eases, you can introduce simple joint warm-ups to maintain mobility. 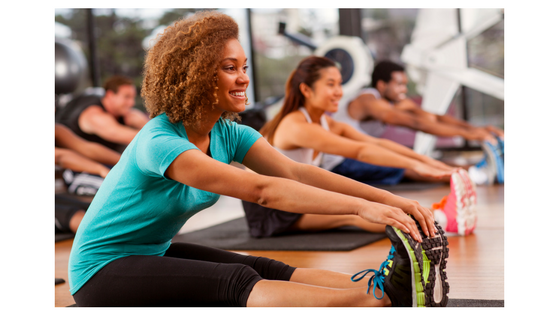 Eventually you can add gentle stretches, but long, sustained stretching is for healthy muscles. Focus on massage, gentle stretching, and joint warmups until the muscle heals. When you feel the stretch in the tendons instead of the muscles. This is especially common in people with tight hamstrings (back of the thigh). If you stretch your hamstrings and feel it at the attachment sites behind the knee or near your rear-end, you aren’t stretching your hamstrings. You are stretching the tendons, and this is not good. If you continue stretching like this, you will injure yourself. Feeling the stretch at the tendons instead of in the belly of the muscle means that your muscles are too tight. You likely have trigger points — or knots — in the muscles, and this creates a condition where muscles are stuck in contraction and cannot stretch normally until these trigger points are released. Although the tendency is to want to stretch our hamstrings more when they feel tight, don’t do it. Focus on massaging your hamstrings and getting rid of those knots. You can use a foam roller, a Yamuna ball, or my favorite spiky massage roller. Heating pads and warm baths with epsom salts will also help release the muscles. You might also have knots along your IT band and around your hips, so check there too. Don’t resume stretching until you can feel it in the muscle instead of the tendons. One of my favorite teachers, Lee Albert, who taught me how to practice Integrated Positional Release Therapy, says that most yoga classes focus too much on stretching hamstrings and adductors (inner thighs), which can create an imbalance, as those muscles are already too long and too tight in many of us. Note: tight muscles aren’t always short — they can be long and tight. He suggests doing fewer forward bends and more bridge poses (especially while squeezing a block between the thighs) to balance the body. You can order his book, Yoga for Pain Relief, for more in-depth information. When you’ve had an accident or trauma and aren’t sure what exactly is injured. About 15 months ago, I was getting out of a car and the driver stepped on the gas while I had one foot on the ground and the rest of my body in the car. It was just a moment, but everything around my hips, pelvis, and back felt weird and spongy, and a few hours later I was riddled with pain. I couldn’t tell exactly what was wrong, but I was really strong and flexible right before the accident, so I assumed that after a couple of days of rest I could fix it with yoga. Even though I would never advise a student in these circumstances to do yoga until she’s been checked out by a doctor, I gave it a try. Not surprisingly, the pain got even worse. It turns out that both femurs and both SI joints were out of socket, and I had a torn glute medius. These are definitely not conditions that can be improved by stretching. I had to get my body parts back in the right place first. Manual therapy and stability exercises got my joints back into their sockets, and then I needed to focus on stability to keep them there. The trauma from the accident combined with the trauma of walking around in an injured body left me full of knots and trigger points. My yoga practice became mostly pranayama (breathing) and meditation. I couldn’t sit cross-legged, so I had to sit in a chair. It wasn’t the same, but years of yoga have taught me to deal with what is, and keeping up with this part of my practice kept me in good communication with my body. I knew that I wouldn’t heal until I got rid of all of those trigger points, so I focused on massage. I went to a few professional massage therapists, but I had so many trigger points, that they couldn’t really get much accomplished in a few sessions, and I couldn’t afford all the massage I would need. So I got out my trusty Trigger Point Workbook, my Theracane and other massage tools, and I worked on those knots myself. I also did reflexology on myself and worked on my body through my feet. It worked! As more knots were released, I had less pain and more mobility and could add more stretching. It’s been a long process, and I’m still not 100% better, but I’m doing pretty well. It can be frustrating to not be able to do everything I was doing before the accident, but it’s essential to carefully listen to my body. And one final piece of advice about stretching: DO NOT GO TO YOUR EDGE!